Welcome to my Gerson Therapy room. As I talked about in an earlier post this is a dedicated room for me to prepare each of the 13 daily fresh juices. This room comes equipped with it's own source of purified distilled water. 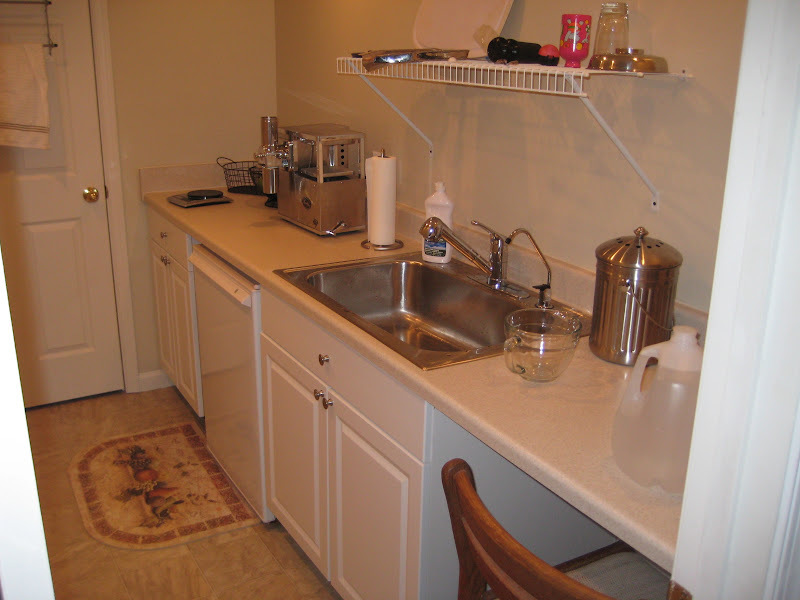 There is a drying rack conveniently installed above the sink. The 6.0 cu foot refrigerator is the perfect size to hold a couple of days worth of vegetables for juicing. 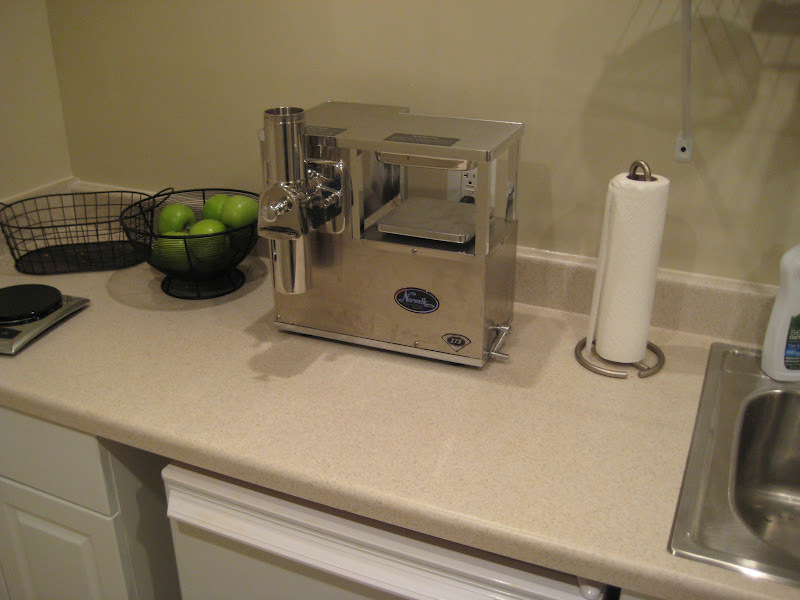 The Norwalk 275-S juicer is serious business. When first getting started with this thing, we had quite a few vegetable explosions. My walls are now a nice shade of tan and carrot. Behind the scenes we have the distiller working around the clock. This is the Water Wise 7000. We have the 8 gallon model with pump. It will generate on average about 9 gallons of purified water in a 24 hour period. At that rate, I have to be quite conservative with my water use. 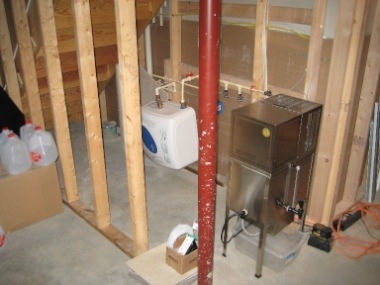 Also in this picture you will see an Ariston 6 gallon water heater by Bosch. Not only does it provide me with instant hot water, but it also increases my water supply by another 6 gallons. All of this is pre filtered using a standard whole house carbon water filter that we picked up at Home Depot. Reminder: Need to change the filter every two months! We are making strides to improve the performance of the water distiller. I just purchased another 4 gallon Ariston water heater with the intention of having it installed in line before the water distiller. We are currently supplying the system with cold ground water and it takes a while for the water to reach a boil. We will preheat and send WARM water into the distiller. This should allow it to start boiling the water much more quickly and it should increase the overall performance. The fun doesn't stop there. There are more plans in the works. Over the coming weeks I intend to install a speaker system that will play via AirTunes that I can control from my upstairs computer or my iPhone. This will allow me to move from one working environment to the next without having to loose my groove by interrupting the music. Whatever I am listening to up stairs will also be playing downstairs. Once we optimize the water distillation process and it becomes more effecient. The distiller will be taking long breaks where it will just be sitting around. Since I didn't purchase this thing to sit and collect dust, I plan to expand the system and collect even more water! I would eventually like to expand the already 16 gallon system to something much larger. Though water conservation is important, I need to have enough to wash all my dishes and take a shower. Which leads me to the next phase of the project. A purified water shower. Right now I can only clean up using a bucket of warm water and wash cloth. Its a good thing that I'm not out running around these days. That could get stinky! I just purchased my camp shower bag which I will manually fill up and hang in my bathroom shower. The next phase of the project will be to somehow run the water to my existing shower, or install a prefab shower downstairs next to the juicing room. Stay tuned for that excitement! Ken Wilson, my uncle and Carpenter. He was the main guy responsible for putting up the walls and and basically building and putting it all together. He dedicated a bunch of his own time to make this happen and I greatly appreciate his efforts! Paul Brockey, my dad. He help with the initial build of the room and then did all the electrical wiring. He engineered and even purchased some of the water purification system. Did I mention that the Norwalk Juicer is his?! Like a good son, I am borrowing it for a couple of years. My brother in law, Scott King and his wife Amy King completed the remainder of the finishing work including trim, paint and kick boards. It is the final touches that make all the difference! Anthony Brockey, my brother. Installed the lighting which converted my smallish man kitchen, into a warm haven built for healing. Tony also networked and brought in specialists to assist in a few key areas. Paul Wega was called in after a few long days of Tony and my dad working hard on the final stages. They had yet to run another electrical circuit from the garage to power the new water purification system. When Paul was called late one night, he instantly agreed to the request to come assist and within 20 minutes or so, there was dedicated power available and a major task has been completed. Mark Britt is a plumber, and friend of Tony. He came over and within one day had the whole system installed, tested and pumping hot and cold water. It may have been our design, but we could not have done it without Mark. A jack of all trades, he even caulked the counter top which turned out perfectly! Mark is planning to return this weekend to assist in the installation of the pre heater. Steven Buxton, my best friend and business partner. Among all the other countless ways in which he and his family are helping out, if it weren't for his "think about how an RV works" statement, I would be carrying a bunch of water jugs around my home. All I can say so that is, thank you! Sorry if I missed anyone. It wasn't intentional. Remember, I was in Mexico when all of this went down! It looks great! What a wonderful gift from family and friends! I am glad you are feeling so much better. When you talk about coffee breaks do you mean the infamous coffee enemas or are you drinking it? If it is the enemas, how many per day do they have you on? Wow Mike, well done. That room looks awesome. You have a great support system with your family and friends. Wow, this is a great way to support you in your continued healing process! Things are good, more organized.